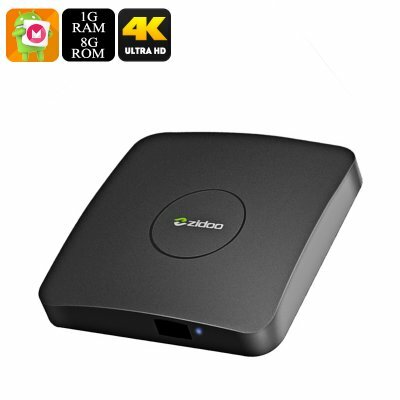 Successfully Added ZIDOO A5 S905X TV Box - Android 6.0, 4K Support, Airplay, Miracast, Google Play, Kodi TV, Quad-Core CPU, Wi-Fi to your Shopping Cart. With the ZIDOO A5 S905X media player, you’ll be able to introduce hour’s worth of online gaming and movie fun into your household, ensuring that you’ll always be ready to have friends over or entertain your family with countless hours worth of media entertainment. Turning your regular TV in a state of the art smart TV, this Android TV box allows you to watch your favorite movies and series on demand. Additionally, it lets you browse the web and play online games on your big screen TV, allowing you to enjoy the ultimate entertainment experience from the comfort of your own living room. Running on an Android 6.0 operating system, this Android 6.0 TV Box comes packed with the latest features. Browse the web, play games, watch movies, and try out TV Applications, there is nothing this Android TV box does not do. Coming with 8GB of internal memory and allowing you to add another 32GB of storage externally, this TV box is guaranteed to offer enough space for you to store all your favorite media and games alike – ensuring that your media player will always be packed with hours worth of fun and entertainment that can be enjoyed at any time. Packing a powerful S905X Cortex A53 64 bit Processor, this Android media system supports the latest media and most demanding games out there. Built for speed, this Quad-Core processor handles whatever you throw at it without you ever needing to worry about slowing down your device. Added to its powerful CPU, this smart home accessory also comes packed with 1GB of RAM and a stunning Penta-Core ARM Mali-450 graphics unit that supports breathtaking visuals and graphics. Packing this hardware, you can be assured that your 4K Android TV box lets you take the most out of your upcoming movie and game nights. Whether you like to play graphically intensive game, enjoy the latest movies, or simply browse the web and take advantage of some of the newest TV applications, the ZIDOO A5 S905X media player is sure to meet your demands. Supporting 4K resolution, this Android 6.0 TV box allows you to turn your own living room into a cinema. With its ultra HD resolution, you can be assured to enjoy vivid colors and mesmerizing details – letting you enjoy a truly cinematic experience from the comfort of your own living room. With its Wi-Fi connectivity, this smart media player additionally allows you to use Google Play and Kodi TV, literally giving you access to millions of free to download movies, games, applications and a whole lot more. So sit back and enjoy, as with this 4K Android TV box in your living room you can be assured that there will never again be a single moment of boredom within your household.